A new Scorpion EVO.... BULLPUP! A little teaser before we launch tomorrow at Bullpup Shoot 2018. 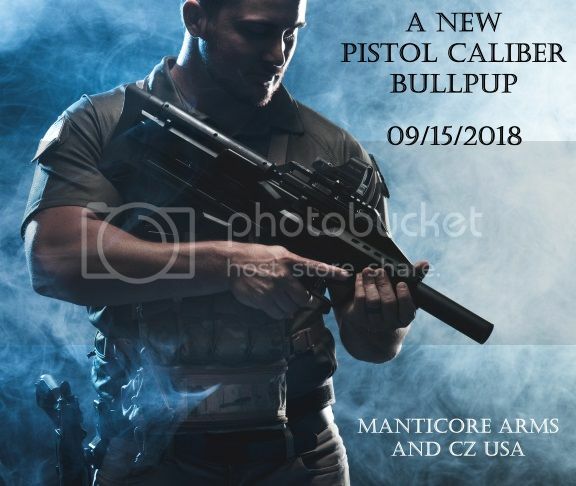 Re: A new Scorpion EVO.... BULLPUP! Looks like he's wondering how to put a handstop on the rail; cause dang that shroud IS hot! I'm glad that you and CZ have continually been making new items, especially right now where much of the rest of the industry is scaling back just to keep the doors open. You and CZ seem to be forging your own road ahead. That could definitely a blast to shoot! Is this with the integral handguard suppressor? Or was that for the factory evo? I'm assuming both will be available to the public at some point? The Catasstrophy; so many contenders! I'm triggered: bull puppy love! Although I once owned a couple, I don't really have a SIGnature. What's the diameter under the handguard for those of us who have already sbr'd our scorpion and would like to screw our cans on underneath of the handguard. Is the scorpion evo serial number visible with the bullpup body on? This could be an issue for NFA guys if not. We just got back from hosting Bullpup Shoot 2018, once we get unpacked I will post up more info. A lot of people got to try out the Scorpion EVO Bullpup today at the shoot, and I suspect you will see quite a bit of interviews and media on it in the next few days too. What is overall length of this? Bullpup fan and also own an X95 with your cantilever forend. Being left handed I will just have to sit back and admire this from a distance. Very cool and innovative design! Curious minds want to know if Manticore Arms was able to avoid bullpup trigger syndrome with this conversion. Well, it does appear to have a cross bolt safety, so I imaging it doesn't even have a factory trigger pack in it. Just a guess though. I'm sure more will come out in the next week.